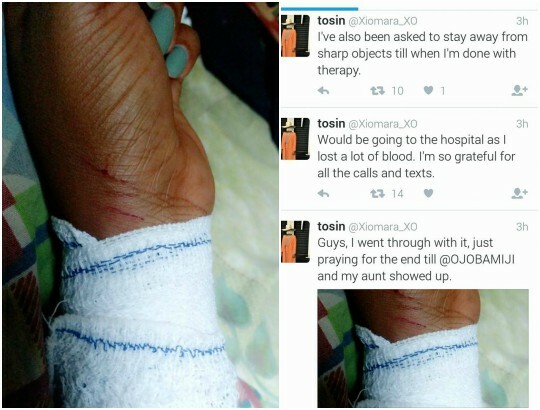 A Nigerian girl, @Xiomara_XO, who took to Twitter to disclose how she was chronically depressed, has been saved from a suicide attempt after slitting her wrist. The lady who was rushed to the hospital after losing so much blood, was shown care and concern by her followers. She has also taken to Twitter to disclose how sorry she is for being selfish. She went further to disclose that she been asked to stay away from sharp objects till she's done with the therapy. Fuccking attention wh*re. If you wanna cut, sideways is for attention. vertical and closer tp the vein will kill you! Try again. yeye fowl wey nor get tail. u no know where lagoon dey make u jump inside. idiot. Nah sorry be your name.